CARFAX 1-Owner, LOW MILES - 1,836! FUEL EFFICIENT 34 MPG Hwy/28 MPG City! Nav System, Moonroof, Heated Leather Seats, Satellite Radio, iPod/MP3 Input, Back-Up Camera, Aluminum Wheels, Turbo Charged Engine, Power Liftgate CLICK NOW! Leather Seats, Navigation, Sunroof, Power Liftgate, Heated Driver Seat, Back-Up Camera, Turbocharged, Satellite Radio, iPod/MP3 Input, Bluetooth, Aluminum Wheels, Remote Engine Start, Dual Zone A/C, Blind Spot Monitor, Lane Keeping Assist. Rear Spoiler, MP3 Player, Remote Trunk Release, Privacy Glass, Keyless Entry. Honda Touring with White Diamond Pearl exterior and Ivory interior features a 4 Cylinder Engine with 190 HP at 5600 RPM*. Cross-Traffic Alert, Child Safety Locks, Electronic Stability Control, Brake Assist, 4-Wheel ABS, 4-Wheel Disc Brakes, Tire Pressure Monitoring System Great Gas Mileage: 34 MPG Hwy. "The 2018 Honda CR-V sets a new pace for its rivals to follow. 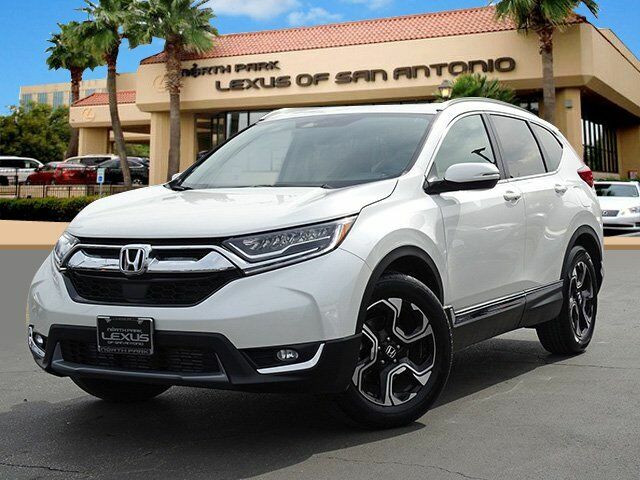 Notably, we picked the 2018 Honda CR-V as one of Edmunds' Best Family SUVs and Best Small SUVs for this year." -Edmunds.com.